Purpose – The article aims to confirm if there is resistance of the Law to Technology in order to admit the protagonism achieved by the second in the last years and to adjust the first to this new reality. Once confirmed the hypothesis, the purpose is to discuss how to overcome this resistance. Methodology/approach/design – Review the works of Gunther Teubner, especially The Law as an Autopoietic System, in order to include Technology as a second-degree system, the same way that are Law, Economics and Politics. Findings – Once is confirmed that the Technology was elevated to the category of a second-degree subsystem, the logic of the interaction between the other subsystems of the same classification will change and it will be demanded from Law the recognition of the new dynamics and its adjustment as to viabilize the communication as a mechanism of pre-regulation between itself and the Technology. Practical implications – Given the confirmation of the hypothesis and the fact that the Law is not yet able to internalize a version of reality that includes the Technology in an effective way, the text explores in what ways this scenario can be changed so that lawyers and law enforcers will acquire the grammar they need, being no longer technological-illiterates. Originality/value – This article is original because it reviews Teubner's work on systems to add a new subsystem, Technology, while discusses the consequences of this change to the legal subsystem. APUZZO, M. WhatsApp encryption said to stymie wiretap order. The New York Times. Disponível em . Acesso em 15.03.2016. APPLE. Apple inc.’s reply to government’s opposition to Apple Inc.’s motion to vacate order compelling Apple Inc. to assist agents in search. Data: 22.03.2016. Disponível em: . Acesso em 24.01.2018. BARBOSA, R. Tércio Sampaio: “Juízes operam conceitos velhos em um mundo novo”. Gazeta do povo. Disponível em: . Acesso em 22.06.2017. CHACON, E. M. Considerações sobre cooperação internacional a partir do novo CPC. Migalhas, 2105. Informativo nº 3.605. ISSN 1983-392X. Disponível em Acesso em 23.08.2017. CHACON, E. M. Encriptação e acesso judicial. Migalhas, 2016. Informativo nº 3.826. ISSN 1983-392X. Disponível em . Acesso em 22.03.2016. CHACON, E. M. A criptografia é uma realidade. LinkedIn, 2017. Disponível em . Acesso em 07.02.2016. CONJUR. Falta de eventualidade e de salário impedem relação de emprego com a Uber. Revista Consultor Jurídico. Disponível em . Acesso em 06.02.2018. GREEMBERG, A. WhatsApp just switched on end-to-end encryption for hundreds of millions of users. Wired Magazine, 2014. Disponível em . Acesso em 08 março 2016. ESTADÃO. WhatsApp chega a 120 milhões de usuários no Brasil. Redação. Disponível em ; Acesso em 06.02.2018. FÁBIO, A. C. Motorista de Uber é funcionário? O que a Justiça brasileira tem decidido. Nexo Jornal. Disponível em . Acesso em 06.02.2018. FRAZÃO, A. A atual realidade brasileira e a crescente tensão entre os imperativos econômicos e o Estado Democrático de Direito. Democracia e Direito. Disponível em . Acesso em 22.06.2017. FREITAS, V. P. A tecnologia vai impactar o direito e seus profissionais. Consultor jurídico. Disponível em . Acesso em 04.12.2017. G1. Justiça do Reino Unido decide que motoristas são empregados do Uber. G1 – Portal de Notícias da Globo. Tecnologia e Games. Disponível em . Acesso em 06.02.2018. HUGHES, E. A Cypherpunk´s Manifesto. 1993. Disponível em . Acesso em 04.12.2017. ICO. Encryption. Informations Commissioner´s Office – ICO. Disponível em . 04.04.2017. Acesso em: 22.06.2017. ICO. Protecting personal data in online services: learning from the mistakes of others. Informations Commissioner´s Office – ICO. Disponível em . Acesso em 22.06.2017. LESSIG, L. Code is Law. On liberty in cyberspace. Harvard Magazine, 2000. Disponível em . Acesso em 22.06.2017. LESSIG, L. Code version 2.0. Disponível em: Edição eletrônica. New York: Basic Books, 2006. Acesso em 22.06.2017. MAY. T. The Crypto Anarchist Manifesto. 1992. Disponível em . Acesso em 04.12.2017. NEVES, R. F. Acoplamento estrutural, fechamento operacional e processos sobrecomunicativos na teoria dos sistemas sociais de Niklas Luhmann. Dissertação para obtenção de título de mestre em Sociologia. Universidade de São Paulo, 2005. ROSNAY, M. D. Peer-To-Peer Law: Distribution as a Design Principle for Law. Media@LSE, London School of Economics and Political Science ("LSE"). Disponível em . Londres, 2014. Acesso em 22.06.2017. SELBST, D.; TICONA, J. Supreme Court must understand: cell phones aren´t optional. Wired Magazine, 2017. Disponível em . Acesso em 30.11.2017. SREEHARSHA, V.; ISAAC, M. Brazil arrests Facebook Executive in WhatsApp data acess case. The New York Times, 2016. Disponível em . Acesso em 09 março 2016. STECKLOW, S. Facebook exec arrested and released in Brazil over encrypted WhatsApp messages. New York Magazine. Disponível em . Acesso em 09.03.2016. TELLES, F. L. Q. Relação entre motoristas e Uber é de trabalho. Gazeta do povo. Disponível em . Acesso em 06.02.2018. TEUBNER, G. Dilemmas of Law in the Welfare State. Belin/New York: Walter de Gruyter, 1986. TEUBNER, G. O Direito como sistema autopoiético. Trad. José Engrácia Nunes. Lisboa: Ed. Calouste Gulbekian, 1993. TEUBNER, G. Societal Constitutionalism: Alternatives to State-Centered Constitutional Theory? Constitutionalism and Transnational Governance, Christian Joerges, Inge-Johanne Sand and Gunther Teubner, eds., Oxford Press, pp. 3-28, 2004. Disponível em . Acesso em 04.12.2017. TEUBNER, G. Rights of non-humans? Electronic agents and animals as new actors in politics and law. Journal of Law and Society, Vol. 33, pp. 497-521, 2006. Disponível em . Acesso em 04.12.2017. TEUBNER, G. The Anonymous Matrix: Human Rights Violations by ‘Private’ Transnational Actors. Modern Law Review, Vol. 69, pp. 327-346. Blackwell Publishing. Maine: 2006. Disponível em . Acesso em 04.12.2017. TEUBNER, G. Law and social theory: three problems (Direito e teoria social: três problemas). Tempo Social, 2015 Disponível em . Acesso em 04.12.2017. TEUBNER, G.; KARAVAS, V. The Horizontal Effect of Fundamental Rights on ‘Private Parties’ within Autonomous Internet Law. Constellations: An International Journal of Critical and Democratic Theory, 2005. Disponível em . Acesso em 04.12.2017. TRUBEK, D.; COUTINHO, D. R.; SCHAPIRO, M. G. New State Activism in Brazil and the Challenge for Law. Paper presented at the Harvard Law School Institute for Global Law and Policy June 2012. Disponível em . Acesso 29.08.2017. YADRON, D. Facebook, Google e WhatsApp plan to increase encryption of user data. Disponível em . Acesso em 15.03. 2016. 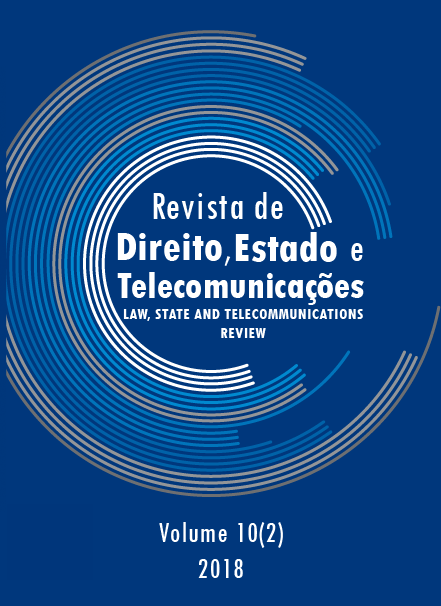 CHACON, E. Resistance of the Law to Technology: A Teubnian Analysis of Communication and Regulation. Law, State and Telecommunications Review, v. 10, n. 2, p. 67-102, 15 out. 2018.